When you've been patronizing from the same work cafeteria for eight years certain things besides desired cuisine begin to affect your lunchtime decisions. It all seemed so vast at the beginning: Indian steam tray buffets, panini pressers galore, depressive sushi chef prepared California rolls, whack-a-mole style soup garrisons, and the grill. The multitude of stations that once provided mood fulfillment and taste bud choice now all appear as one amorphous corporate alternative to the never ending make-your-own salad empires of midtown Manhattan. Before I might have chose the grill to satisfy a greasy protein craving but now I meander towards the line to observe Ferdie, the most skilled and dedicated worker in the kitchen. His spirits are mysteriously beyond the work's obvious drudgery. He completes the most seemingly inane tasks, like the setting of two cooked egg whites on rye toast, with a level of previously unimaginable precision. My reason for entering the deli line last Tuesday was different. A woman who I sporadically fancy from afar was standing at the back of the line with her friend. When it became her turn to order I rotated my head 20 degrees counterclockwise in order to better hear what she had decided. In a slightly annoying tri-state area accent she blurted out "Ham and cheese on wheat toast." When the server asked her what kind of cheese the woman paused, visually took in her neatly stacked options sitting behind the germ protected glass pane, and calmly replied "American cheese, please." American cheese!?! 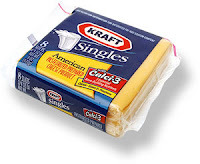 Kraft Singles?!? My heart sank. I couldn't believe that she had overtly made such an obviously poor decision. It will never be the same between us. I could never fancy a woman who preferred American cheese over other less processed and more flavorful cheeses no matter what the circumstance. Add it to The Deal Breaker Files.